I am very fascinated by the Senegalese Ligue 1 – a league where only one club has scored more than one goal per match in average (Casa Sport – 30 goals in 28 matches) and where still no striker has reached double figures. Nevertheless, the league is slowly getting more and more professionalized and the media coverage is better than in any of the four other leagues I follow. * At the time of writing US Ouakam is rather shockingly in the lead, six points in front of Casa Sport with only two matches left to play. In other words, US Ouakam needs only one point in two matches to win their first ever championship. Personally, I have some theories on why US Ouakam, a rather modest and unfashionable club, looks set for the title. – Pape Latyr Ndiaye (born 30.11.1977) is the best goalkeeper in the league. USO has only conceded 13 goals in 28 matches and the experienced Ndiaye has been simply brilliant, forcing his way into the squad of the Senegal national football team during the recent months. Ndiaye played his last match for “Les Lions de la Teranga” against Benin on 07.02.2007. – USO has shown a remarkable consistency this season and their first eleven has mostly been the same all season. Sadio Diao (attacker), Jean Francois Diokh (central defender), El Hadji Moussa Dione (captain and defender), Karifa Kourouma (left-winger) Barthelemy Mané (midfielder), Pape Latyr Ndiaye (goalkeeper), Pape Modou Ndiaye (left-back), Mamadou Sylla (defender, born 22.02.1985) and Pape Seyni Touré (midfielder), a total of nine players, have all played more than 20 league matches for USO season. This is quite rare in a league where teams tend to try a lot of different players. USO has been lucky avoiding injuries on key players and as far as I know, no players have attended long trials at foreign clubs during the season. Trials in the middle of the season are a problem at other clubs, especially as Casa Sport. – USO has a great mix of experienced, hard-working players and talented, creative players. Sadio Diao, Jean Francois Diokh, El Hadji Moussa Dione, Pape Latyr Ndiaye and Pape Seyni Touré are all well-known players in the Senegalese Ligue 1 who have been around for several seasons. For foreign scouts, talented, young players such as left-back Pape Modou Ndiaye, playmaker Barthelemy Mané, Guinean left-winger Karifa Kourouma and right-winger / attacker El Hadji Baye Oumar Niasse (born 18.04.1990) should be the most interesting players. 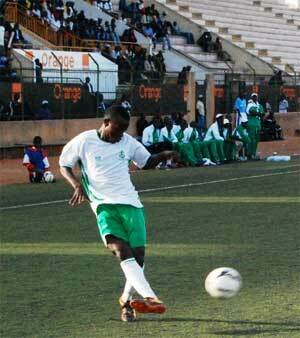 Kourouma has recently been part of the Guinea U-23 national football team. Pape Koukpaki 5, El Hadji Baye Oumar Niasse 4, Sadio Diao 3, Pape Seyni Touré 3, El Hadji Moussa Dione 2, Karifa Kourouma 2, Matar Moussa Diagne 1, Jean Francois Diokh 1, Ngagne Diallo 1, Barthelemy Mané 1, Mamadou Sylla 1, Own Goals 1. Target man Pape Koukpaki (born 02.04.1979), one of the best beach football players in the world, started the season on a high note but has not scored since 01.03.2011 (Round 9) and has played few matches since May. El Hadji Baye Oumar Niasse and new signing Mbaye Babacar Ba (born in 1985), formerly of Stade de Mbour, have both recently featured in the center forward role. Expectations were high when Ba signed for the club, but he has yet to score in the USO-shirt. * Casa Sport is currently in second position and this club has some really interesting players. I have previously presented the midfield general and captain Stéphane Badji (born 29.05.1990), arguably the most interesting midfielder in the local league, and lively striker Emile Paul Tendeng (born 09.03.1992), arguably the most interesting striker in the local league. Badji has lost several matches this season, mostly because of trials and national team assignments. Tendeng has played approximately 20 league matches so far, scoring only three goals. The picture is of Tendeng and is taken from aps.sn. Casa Sport also lost their commanding central defender Pierre Coly and winger Abdou Sagna in March 2011. Both players were key players and according to unconfirmed reports they joined Sharks FC in Nigeria. My theory is that Casa Sport would have been league leaders if they were able to maintain Coly and Sagna, if Badji was available for more than ca 50 percent of their matches, and if Tendeng had shown better form in front of goal. Both Aliou Coly and Aliouse Thiaw, both quality strikers, have scored more goals than Tendeng, which is somewhat surprising. Nevertheless, there is a lot of positivity at Casa Sport at the moment. During the season, some really interesting young players have emerged from pretty much nowhere. I am especially thinking of the attacking trio of Karim Ben Badji, Youssouph Coly and Siaka Sané. Some of the more experienced players have also stepped up, especially left-winger Assane Dramé. Dramé travelled to Nigeria together with Coly and Sagna but returned after a couple of months. Midfielders Mamading Kidiera (born 12.07.1988) and Christian Pascal Diatta are also having good seasons. Aliou Coly 6, Assane Dramé 5, Alouise Thiaw 4, Emile Paul Tendeng 3, Youssouph Coly 2, Siaka Sané 2, Mame Saër Thioune 2, Karim Ben Badji 1, Stéphane Badji 1, Christian Pascal Diatta 1, Abdou Sagna 1, Mody Traoré 1, Own Goals 1.